Children use a variety of monitoring comprehension strategies to understand texts. Students learn 11 fix-up strategies that help them pronounce words, determine meanings in context, and figure out words using knowledge of root words, prefixes and suffixes. In addition, readers learn to figure out the meaning of unfamiliar words by figuring out how to pronounce words and how to infer from context. I can use fix-up skills to unlock pronunciation or figure out meaning or both. I can pronounce words, determine meanings in context, and figure out words using knowledge of root words, prefixes and suffixes. I can read multi-syllable words. I can use the online dictionary to help me figure out words. I can use the phonetic spelling in a dictionary to help me figure out words. Getting started: pronunciation, meaning or both? I teach minilessons that either introduce or review 11 fix-up strategies all children should master. I ask students to add to their lists in their notebooks as I introduce and we work with each strategy. They are not in any specific order. As a matter of fact, students use multiple strategies most of the time. The most-effective fix-up strategy readers try first is sounding out a word. However, when faced with an unfamiliar, multi-syllable word or sight word, there are other cues children should have in their reading toolkits. Teach these skills to any student who depends on one favorite fix-up strategy and that is "sounding it out”. Often children try “sounding it out” and it doesn’t work and then they have no other strategies to try. I've gathered these strategies from many sources and from working with children throughout the years. I list the skills on a reading bookmark and share it with each child. Download Fix-Up Bookmarks. I recommend teaching #1-8 to emerging readers and the whole list to developing readers. Sound out the word. Take words apart in chunks or syllables and sound them out. Use context clues. Read around the words and figure out the unknown word. Remember. Use connections to understand what the writer is talking about. Try to think about what you know to repair confusing parts. Try to remember where you have seen the word or the root word before. Use the picture to get information to help you figure out the word. Skip the word and read on. See if you can come back and figure out the word. Use the (online) dictionary to find the sound spelling and/or the meaning. Listen to the pronunciation of the word and see if that helps you recognize it. If not, read the definition and select the one that matches the word in context. Study the root word, prefixes and/or suffixes to get clues as to the meaning of the word. Use your Spot and Dot rules. Take a guess. Know when to guess and when to look up a word. Give yourself a gift. Keep a word list. Keep track of new vocabulary and their meanings in your notebook. For my minilessons, I find or create passages that compel the students to use each strategy, similar to Keene and Zimmermann’s approach in Mosaic of Thought. They forced me to use my strategies when reading the passages at the beginning of each chapter. I share my Fix-Up Unit on this site with passages that will force students to do the same. Then, you will name what the students did so you build a common proficient reader language in your classroom. Your groups may need one day or many days to learn each of the 11 fix-up skills, depending on their grade level and reading sophistication. At the end of reading workshop, come together in a gathering spot. Encourage students to share how they figured out the pronunciation and the meaning of difficult words. The discovery and discussion that corresponds with the reading will help students become more proficient. Also, tell your students that unlocking what texts mean is a lifelong skill. Readers never arrive, per se. As they become better readers, they use these very same strategies on more difficult texts. Again, the need for long periods of time for study is obvious, and your students will be smarter for it. Children love discovering how to unlock the pronunciation and the meaning of unknown words. They enjoy the puzzle-solving aspect of working with our language! I've gone into classes thinking I'd be teaching a 15-minute minilesson only to find the students didn't want me to leave 45 minutes later. One Friday afternoon, I was called to cover a class and there were no lesson plans. 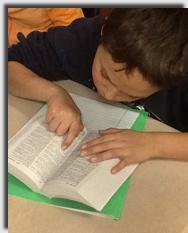 So, I gave each child a dictionary and taught how to use the sound spelling to pronounce multi-syllable words. We spent an hour just reading the dictionary trying to find the biggest words so we could stump our friends. Teachers share how much fun their students are having, which makes for happier teachers. I hope you get the same results by teaching reading this way. So students can remember the 11 Fix Up strategies, download these bookmarks for them. Use this to help students unlock multi-syllable words. A rule sheet teachers can carry in their planning books. Apply the strategies learned in the minilessons to real-world texts. This website has 2 kinds of memberships: free and $99 for a year. There are so many ideas sent to you via email every week. Authors like Aimee Buckner, Debbie Miller, Brenda Power, Franki Sibberson, and The Sisters – just to name a few – contribute regularly. Check it out for yourself. WORTH IT! In this video, primary students show other students how to use the strategy. Intermediate students created this video to show how to use the strategy.